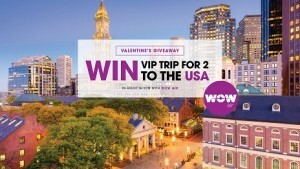 To celebrate the season of love, Carraig Donn have teamed up with the crew at WOW Air to WIN a fantastic VIP trip for 2 to the USA! People can enter on the Carraig Donn website, here is a link Best of luck! Carraig Donn opened the doors of the new store in City Square in December and the public reaction to the store has been fantastic. The combined selection of fashion, homeware and gifts in a new modern bright store is proving a big success.